I have been working on many holiday crafts lately. I just had to make these amazing wreaths. I have made two different ones so far, in my searches I have found many more I just will have to make through out the year. 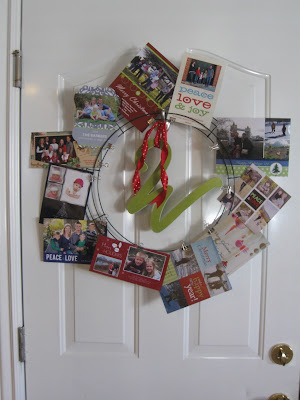 The first one I made I got the idea from All Things Thrifty Lima Bean Wreath. I fell in love with it and wanted to make me one. Once I decided I wanted to hang it on my french doors I decided I needed two. 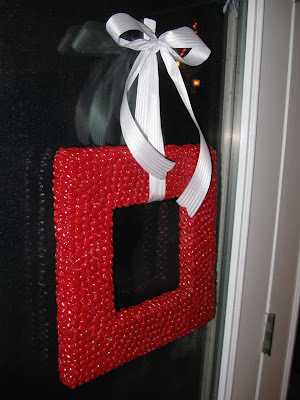 While shopping at JoAnn's, I was inspired to try and make a square wreath instead. Who ever said they had to all be round??? 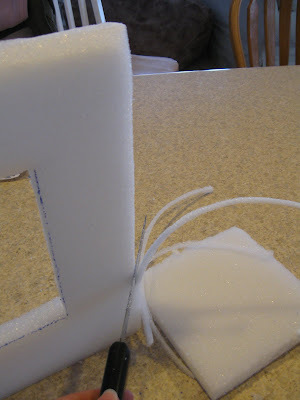 I purchased 2- 12x12 pieces of Styrofoam, about an inch thick, for $5 each and used a 40% off coupon. I cut out the center of each square to make a 6inch square in the middle. Then I also trimmed a little of the corners so it was rounded and not so square. (just a side note... I hate the sound of Styrofoam, so this was difficult for me to get through.) But I'm sure glad I did. The example used Lima beans, but I have a million Pinto beans lying around (honestly I wont be cooking them anytime soon). Since I plan on painting the wreaths anyway, it will be no big deal. Pinto beans - FREE! I hot glued them on at a 45 degree angle. It took just a little less then a 1 lb. bag of Pinto beans to do each wreath. (I will have to think of another project for the other 20 bags I have been storing.) It was pretty tedious work and took about 4 hours for the first one and about half the time on the second. Minus the 15 minute break when I burned my finger so bad that I sat there wanting to cry. But I did make it through. I wanted to paint my wreaths Red. It has to be one of my favorite colors. So first I sprayed it with white Primer which really made all the dumb glue strings stand out. Then I sprayed it with the Red. Which helped re-hide some of the glue and the white cracks between the beans. Tied it up with some ribbon that I also purchased at JoAnn's for a few dollars. I really think it turned out awesome. They fit in the space perfectly and just add a fun look to the glass doors. Both wreaths were about $10 together!!! Another wreath I made was based on function more then just aesthetics. I have really wanted a fun way to display all of those Christmas cards from family and friends. In years past I would just tape them on the door but It looked pretty bad. So I searched and searched for inspiration on an idea. I knew I still wanted it on the door because of lack of space to put another object and I wanted it where we will all see them. After, a couple different trips to different craft stores I found the wire wreath frame for about $4 and this block "W" for $5. I painted the "W" green with paint I had on hand. Then, I bought a package of clips for $3 and the ribbon was some I already had. I Think it turned out great for about $12!!! It makes all the cards look amazing and it is fun to have a place for them all to go. I love the red wreaths! I have been working on round ones with lima beans, I never even thought about spray painting them, I love that. I love you blog there are so many cute things and great ideas! so cute. they look great red. also love the w! Those are so flippen cute!!! I cant wait to see the others! !